Haven't received anything? please contact support@amigoslots.com for assistance. If you fell in love with Rainbow Riches, then it is only a matter of time before you fall in love with Rainbow Riches Drops of Gold. While it may not be worlds apart from the original, Barcrest seem to have kept the perfect balance between familiarity and innovative excitement! While there have been other sequels released since the original game in 2006, it’s hard not to get excited with every new release from Barcrest and SG who have combined forces to create some of the most loveable slots out there. The leprechaun from Rainbow Riches has pretty much become a poster boy for the online slot world. Although, it has to be said that back then, he wasn’t half as stunning as he is now, graphically – of course! If you haven’t been acquainted with the charming fellow before, it is our pleasure at Amigo Slots to introduce you to the iconic character which may one be bigger than the Lucky Charms leprechaun? Barcrest can hope. 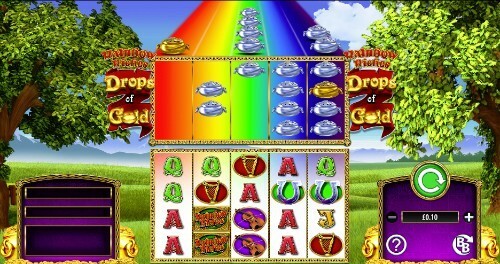 The original Rainbow Riches game transports you to the land of luck; otherwise known as Ireland. Which over the years has been a hotspot for game developers to explore with their online slot games. Players love to soak up the folklore of Ireland as they spin the reels, hoping that some of that good old Irish luck will help them win some life-changing amounts of money. Considering that Barcrest have paid out millions through Rainbow Riches, it may not be all blind faith and superstition after all! The Rainbow Riches uses the lucky leprechaun to guide you through the online slot which is absolutely bursting with Irish culture. You’ll see the green lush lands of rural Ireland in the background while you see the fun-themed symbols on the reels which are framed in a Celtic band, giving Rainbow Riches Drops of Gold a really authentic feel. The reels to Rainbow Riches may look ordinary, but they’re not, they have pots of silver and gold waiting to rain down on you, which will happen with a little help from the wild symbol! The symbols to Rainbow Riches are a mix of themed symbols and your fairly standard symbols. Which you’ll have to agree is fairly generous! The wild symbols in Rainbow Riches are the gold and silver pots off gold which can substitute all other symbols aside from the scatter. The return to player rate with Rainbow Riches can reach up to 97.75% if you are playing with some of the bonus features which we will introduce you to now! As we said earlier, you can expect to see plenty of innovation following on from the original with this online slot, so let’s find out what all the bonus features are about with Rainbow Riches Drops of Gold! We already spoke of those wilds that would drop from the rainbow at the top of the reels before. To make this happen, you’ll need to see the wild on reel number 5, then, the pots which happen to be at the bottom of the rainbow will fall and substitute those below it on the reels. For the classic free spins bonus round, you’ll need to find 3 or more of the trigger symbols to enter. How many spins you get will depend on how many trigger symbols fell on the reels. You’ll also be able to trigger the free spins during the round – for an infinite number of times! This bonus features are totally optional, and only for the high rollers! The bonus features are activated whenever you put down a certain stake amount. How much you place down will determine what perks you get. £20 = expanding wilds instead of normal wilds. £30 = expanding wilds instead of normal wilds and all lower valued symbols will be removed from the game play so that only the high-value symbols remain with the triggers and the wilds. £50 = increase the number of bet line that are active to 100 active bet lines, or 200 if you are playing in the free spins bonus round. Everyone loves an underdog story, but, Barcrest have never been underdogs! Even before the days of the internet they thrived as industry leaders in the land-based gaming world. Yes, the time where we would have to leave our sofas to enjoy a little bit of slot-based fun! While there is a lot to be said for land-based gaming, no one can deny that playing from the comfort of your home via your mobile or your laptop isn’t infinitely more appealing sometimes. Not to mention the massive amount of variety which mobile and online gaming brings to the table. So, when Barcrest first started out back in 1968, if someone said that you would have the choice of thousands of games at your finger tips on a device that was 3” and could win you life-changing sums of money, you’d probably think they were crazy. But it was through talented and innovative minds such as those at Barcrest who helped to drive the change forward. Of course, computers and the internet had to become widely accessible first. So, in the meantime, they were the go-to manufacturers of gaming terminals. Not just in the UK, but for the rest of Europe as well. If you have played any traditional slot machines, chances are you’ve played one of Barcrest’s and you haven’t known about it! Even though the company was undoubtedly successful away from the digital world, they still fought hard to be ahead of the curve when everything started to become digital. This gave them the perfect positioning in the market to establish themselves as leaders of quality content. Even though companies such as Pragmatic Play and Microgaming may be putting out plenty of spectacular online slots, it is still important to think of Barcrest as the pioneers. Just as you would class New Order to be the pioneers of Synth Pop! Fans of mobile gaming in particular have a lot to thank Barcrest for! With no shadow of a doubt, the most successful online slot game which Barcrest produced was Rainbow Riches which was released back in 2006, since then there have been 6 sequels, but they have still found the time to explore other themes in between! This may be due to the fact than in 2011 pretty big changes happened for Barcrest when they were bought outright by the media giants Scientific Gaming. Barcrest’s talent hadn’t gone unnoticed, so when the two giants combined, they became an unstoppable force in the online slot industry. They also brought another powerhouse leader Global Draw on board to ensure that they were unstoppable! Anyway, back to Rainbow Riches Reels of Gold! Here’s how Barcrest and SG described the online slot just after the release. The review is on their website where you are able to try the online slot out for yourselves for free before you come back to us at Amigo Slots and enjoy the advantages of spinning the reels with us! It would seem by that description that Barcrest and SG have let the talent and the excitement speak for itself with Rainbow Riches Drops of Gold, and why wouldn’t they? It’s a popular hit, just as they predicted! Usually, in this part we like to showcase online slot games from the same game provider and other competitors. However, what Barcrest and SG have created with the follow up games to the original Rainbow Riches is more than enough variation. Whether you’re looking for slightly different bonus features, a classic free spins slot, something a little less complicated, or something very complicated, the game developers have you completely covered with your options below. We’ve done our best to outline all of the similarities and differences to make it easier for you to choose the online slot which is most preferential to your personal playing style. Every player is different, that’s why Barcrest & SG worked tirelessly to ensure that all slot fan’s needs were catered for! Rainbow Riches Pick n’ Mix Online Slot: The sequel to the original Rainbow Riches online slot was probably one of the most hotly anticipated releases in the slot world. Everyone was pumped to get a piece of the charming Irish action once again, after all, Barcrest had kept fans waiting for over ten years before they released a sequel. There was quite a lot riding on Rainbow Riches Pick n’ Mix, but it all paid off, thanks to the unique feature which has never been seen anywhere outside of this online slot. And it’s definitely much more than just a novelty! If you have ever wished that you can pick and choose your own bonus features, now you can! You will be presented with five different bonus rounds, pick the three you would most like to play with, then that is what you will experience when you play! You can change your selection at any time and really tailor make the experience so that it is suited to your preferences! Nice! Due to the variance in the gameplay, the RTP will differ, you’ll see no less than a 96% RTP and no higher than a 98% RTP. Rainbow Riches Reels of Gold Online Slot: Rainbow Riches Reels of Gold was published just after the first sequel, some may argue that publishing two very similar games in the same year was a risky move, however, that move definitely paid off. As they created an online slot game which was just as uniquely challenging as Pick n’ Mix. The original online slot and Drops of Gold taught us that Barcrest really do like to make their slots as intricate and exciting as possible. But, it is easy to feel that they may have gone a little too far with Reels of Gold. Learning the rules to the gameplay could leave even the most experienced of online slot players with a headache. And following the reel action isn’t much easier either! With Reels of Gold, you will get not one, but two different sets of reels which will both spin at the same time. That may take a fair bit of getting used to! Aside from that, there are 100 bet lines to choose from, and a fairly ridiculous amount of bonus features which stands at the total of eight. Barcrest and SG may have cooked up the most complicated online slot ever with Reels of Gold. Especially considering that they drafted in a fairy that will appear at random and change the symbols on the reels before your eyes. At least the return to player rate is set to a generous rate of 98%. You will have earned the higher RTP after learning all of the rules that go alongside Reels of Gold! Rainbow Riches Free Spins Online Slot: Everyone knows that online slot game players love free spins rounds, and perhaps no one knew it better than Barcrest and SG gaming, which is why they reinvented Rainbow Riches with a more classic feel. It was a major complaint amongst many people that the original and the sequels have all been a little difficult to get to grips with. It may have put plenty of people off the Rainbow Riches franchise, but with the Free Spins slot, now beginners have the perfect game to start off with! Much in the same way many online slots only offer a free spin round, this game strips it right back to the basics. Although, the free spins round is anything but basic! Along with the ability to play for free, you will also be treated to plenty of generous multipliers as you spin for free, oh, and there’s absolutely no limit to the number of free spins! Of course, you’ll be given a low amount to start, but you’ll have the ability to retrigger that amount while you are enjoying the free spins! The only slight draw back is that you will only get to play with ten different pay lines which is slightly disappointing! But, to make up for this, there are fewer symbols for you to match on the reels! So, it’s a case of swings and roundabouts with Rainbow Riches Free spins! Rainbow Riches Fortune Favours Online Slot: It looks like Barcrest and SG couldn’t get enough of the Rainbow Riches franchise in 2018, because yep, you guessed it, this one was also released in 2018. However, Fortune favours differs from the other sequels in the way that it is much less about hitting you with super new and exciting features. You can think of this sequel revisiting the classic of the original. After all, the original is now considered to be a classic, or should that be vintage? Either way, pretty much what you got with the original you will also see in Fortune Favours. You’ll just be able to see it all a lot more clearly thanks to the updated graphics! Rainbow Riches Home Sweet Home Online Slot: As you can expect from a slot with this title, you can expect a fairly homely feel from Rainbow Riches Home Sweet Home which was also released in 2018 (Barcrest and SG must be exhausted by now). This slot is the most recent of them all, so, it’s still too early to say if the game developers bowled over the reel spinners enough for this game to stick around. There’s a slight variation on the original with a 5x5 reel set up, it also offers some pretty innovative bonus features and 100 different ways to win! It is always a surprise that there never seems to be much media coverage when it comes to the news of new online slot games, as you would see with music, TV, or film, especially considering how popular online slot games are now in the UK! However, Rainbow Riches Drops of Gold still got a fair bit of attention, proving that it isn’t just us at Amigo Slots who got super excited about the release of the new online slot in 2018! Here’s what a few other people had to say about the iconic online slot game! Know Techie included Rainbow Riches Drops of Gold on their list of games made by the biggest game provider’s, they were just as keen to celebrate Barcrest & SG’s efforts as we were! Their guide which was created in February 2019, provides an impartial view on the best and biggest online slot game providers. February 2019 seemed to be a fairly big month for SG, as it was in February when they headed to the ICE event in London, where all of the major league iGaming developers get together and showcase what they are getting up to. “In every market, across all channels, player expectations are driving critical paths of innovation. Teams at Scientific Games across every product offering are creating growth opportunities and value for our customers through richer and more immersive player experiences." Amigo Slots is operated by Jumpman Gaming Limited which is licensed by the UK Gambling Commission ('UKGC') for customers in Great Britain and the Alderney Gambling Control Commission ('AGCC') for customers outside of Great Britain. All games on Amigo Slots are regulated by the UKGC or both the UKGC and AGCC. Registered business address (no correspondence): Inchalla, Le Val, GY9 3UL, Alderney.